I've spent some time to work on a (yet premature) plugin to show libraries grouped by module in the project view. I've attached a screenshot, you can see a project in IDEA X where the external libraries are grouped by module. Additionally, each module has a Libraries child node. If there's any interest to turn this into a usable plugin I'll try to do this. hi Wallaby. i think this plugin must be implemented and should support non maven projects as well. Once any version will be available, i'll try it. Wallaby, great work you're putting into this. Finally someone with a solution to this bug! Once again, great work! There's now a first version of the plugin available at http://plugins.intellij.net/plugin/?idea&id=5831 . I've tested this with the latest EAP. Please keep in mind that this is a bad hack to get libraries grouped by modules. Currrently the behaviour is not configurable, you'd need to uninstall the plugin to get the origignal behaviour back. Update: I've changed it to list all libraries (proejct and single-module libraries) in the module groups of "External libraries". I need a complete listing of dependencies for a single module. Not sure if this behaviour suits you, let me know what you think. Unfortunately i can't download file from web and from within idea as well. i hope it's just a delay. Thanks for the release and congratulations! it works for me here. I just put an update online which supports IDEA 9.x as well (builds starting with 95.0, earlier would probably work as well). At the moment only the plugin manager works, the public download has to be unlocked by a Jetbrains guy, I think. Which version of IntelliJ do you use? the plugin available now. i'll post my feed back once i have something to say. p.s. i use 9.0.3 community edition. 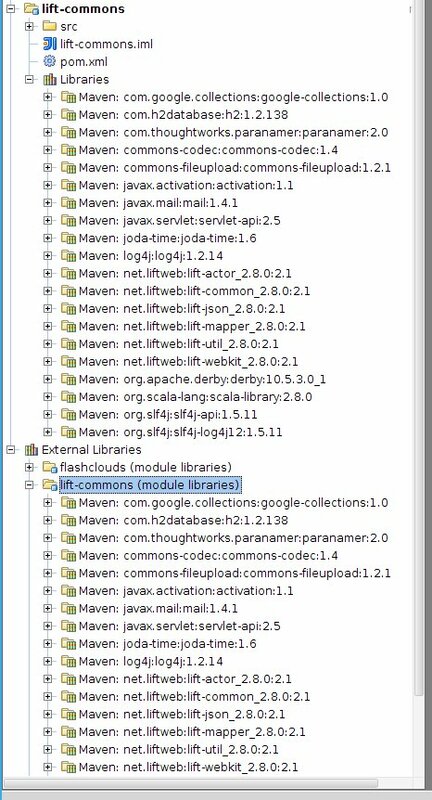 i've checked plugin with maven and non maven project. i've found it looks like it should be, but navigation wtih Alt+F1 unstable. to reproduce > open module, navigate to a class imported from a external jar, press Alt+F1. Idea will try to open the class in the project view/module libraries, but the node collapses immediately after had been opened. Little question - is it possible to visualize a scope of the library? The navigation is an issue, yes. Adding the same library twice makes things difficult because the tree (IMHO) assumes that a certain file or class is only available once in the tree. I could implement it in a way so that module libraries do not show the content and are non-navigatable (using Alt+F1). That's the only (hopefully possible) way I can see right now. It's possible to show the scope for a module item, as far as I can tell. i don't know idea api well, but it looks reasonable to implement an module libray as a separate object per module for jetbrains guys, even it refers to to the same jar. If so, there should be way to find a module library jar and hadle it. If not, it looks like best you can do - is to follow original behaviour.